Implement the look and behaviors that the designers created. 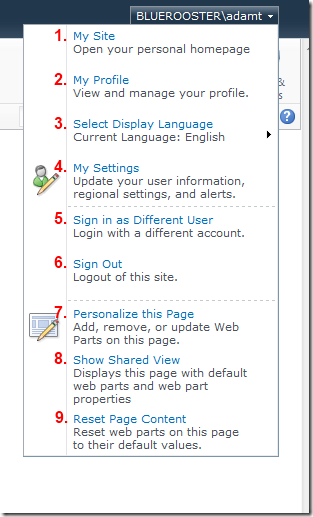 Exclude some default SharePoint menu items (such as My Regional Settings). 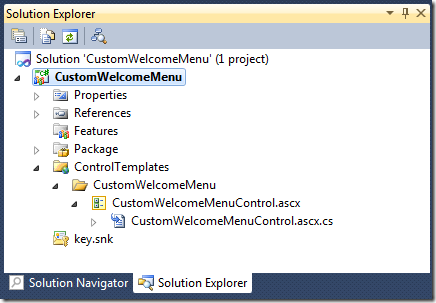 Reuse some existing SharePoint menu items (such as Sign Out/Sign in as a Different User). Allow for the addition of other custom menu items in the future. Display thumbnail of the user’s profile picture. This is part 1 of a three part series. My general approach to solve this was to create a .NET User Control, installed in the _controltemplates directory. I could use code-behind and the API, and have the most control over display and formatting of the menu. 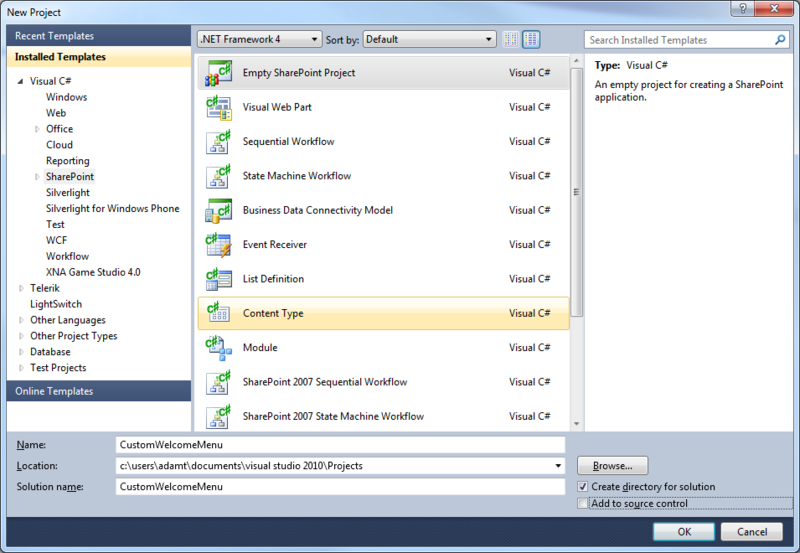 This could all be deployed with a WSP package, using Visual Studio 2010. I could leave out any menu items I didn’t need, add any custom items necessary, and write code to recreate any SharePoint menu items that I wanted to keep. 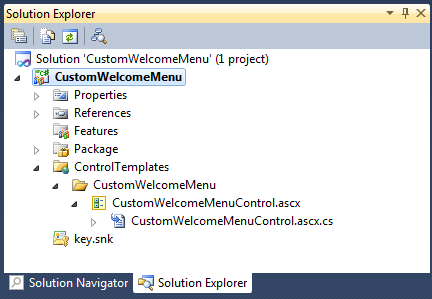 My next task was to figure out what I could reuse from SharePoint’s own menus, by looking into the OOB Welcome menu. 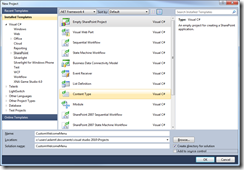 Microsoft.SharePoint.WebControls.PersonalActions – This is the primary control, responsible for most of the menu items and the menu core. Items 4-9 below (plus another item, “Request Access” that isn’t shown in the screen shot) are rendered by this control. The menu and its items are rendered as <menu> and <ie:menuitem> nodes in the html. Microsoft.SharePoint.WebControls.MUISelector – This is responsible for displaying language selections (item #3 below) if you’ve installed language packs. 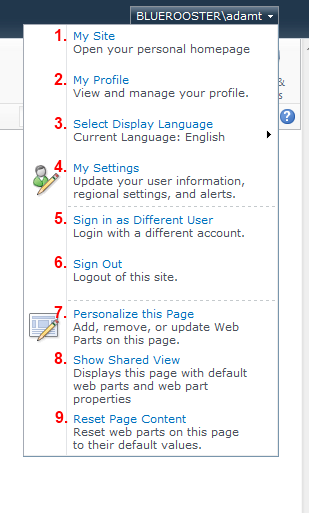 Microsoft.SharePoint.Portal.WebControls.SocialNavigationControl – This is responsible for displaying My Site and My Profile links (items 1 and 2 below, part of SharePoint Server). The PostCacheSubstitutionText control will prevent the username from being cached on the server as part of output cache settings, so that if a user uses the Sign in as a Different User menu item, they will always see the current username instead of a cached one. You can play with the PostCacheSubstitutionTextType to change how the username is displayed. In this post, we deconstructed the OOB welcome menu control, figured out how to get the user’s profile picture, and got the user’s display name into the menu. Next, check out Part 2, where we learn how to display links to My Site and My Profile.